Mariscos Tino's el Malecón is located in the beautiful Puerto Vallarta, in the state of Jalisco, consider as the friendliest port in the world. A priviledge location for this restaurant, full of history, tradition and beauty, as it is just at the begining of the boardwalk. The history of Tino's start in the 90's, it was a small place out of downtown Puerto Vallarta, at the time it could only host 12 persons. Don Tino,his wife and his mother started the bussiness, they offered just cocktails and toasts, simple dishes, after some months they included in the menu the zarandeado style fish; this dish became the signature dish of the house. After two years, the bussiness grew and the construction of a new stablishment began in 1993, this is when the oficial history of Maricos Tino's started. From this moment, the menu grew welcoming dishes like the Tino's Shells, Crab Tacos, Tino's Grill among others. By 1996 Tino's was the favorite for locals and tourists. In 2009 Tino's el Malecon open its doors in the heart of Puerto Vallarta. Restaurante Tino's el Malecón is a new place that can host up to 130 persons in different stages, with a tropical ambience with bright colors like yellow or orange offer the guests a unique and special atmosphere. Its Kid's Club where children can play in a safe and fun environment while the parents enjoy their meals with no worries. The traditional Zarandeado Fish is considered the signature dish. The staff will recommend you the most exquisit flavors, as well as the Chef's Specials pair with a selection of wine that will make more enjoyable your experience. 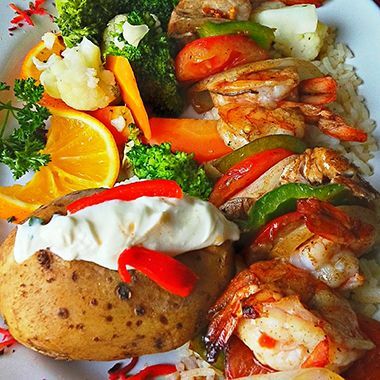 Considered the place to visit for the Seafood, simplicity, quality and a rustic Vallarta feeling, surounded by the years of traditions of its kitchen tell the story of flavor of Tino's Malecón, the perfect blend between the sea and the tradition of a town. Fried shrimp stew and grilled with garlic, chile de árbol and spacy sauce. All ingredients are processed with the highest standards of hygiene and quality. However, the consumption of raw seafood is at your own risk. If you are allergic to any product, please let us know. Prepared with brandy, Italian sauce, mushrooms, onion, garlic and spinach gratin sauce. 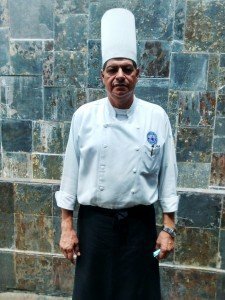 The Chef Rogelio Gaviño, who runs Tino's kitchen has a wide experience running kitchens in the beautiful Puerto Vallarta and with over eight years experience and tradition in Tino's el Malecón. His is the mind behind the culinary fusions and creations that delight the tastes of its visitors. Rogelio Gaviño offers three specialties to all visitors. One of them is the famous "Zarandeado Fish" catch of the day prepared with a specil sauce, red onion and homemade sauces. The second dish is "Coconut-Mango Shrimp" acomppanied with a sweet salad, and finally the "Meuniere Mussels" prepared with butter, garlic and white wine. Average Check $300 pesos M.N.